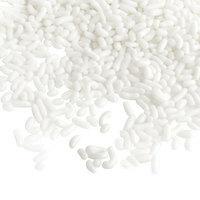 Reviews | White Sprinkles - 10 lb. Put the finishing touch on all of your desserts with these fun, decorative sprinkles! They'll add sugary sweetness and unique texture to any dish. The uses of sprinkles are endless, making them a versatile ingredient to have on hand. Sprinkle these tiny, thin, rod-shaped confections into your signature cookie batter, atop a flavorful ice cream sundae, or use them to garnish frosted cupcakes. Whichever way they're served, they're sure to be a staple for your ice cream parlor, bakery, or diner. And with 10 lb. of sprinkles, you'll be in good supply! 10 pounds of white sprinkles is really a lot but if you use sprinkles daily for your desserts this is a really great buy. They have a nice white color. I love the quality of these sprinkles. They are the perfect size, great tasting, and the quantity you get will last you a while. The color is more of an ivory white than a pure white, which I love-it stands out more from my cake pops! Was used at our wedding in a “send off” instead of throwing bird seed. Looked really great in pictures! Great quality & pricing. Highly recommend. I love using white sprinkles because they just sparkle on our chocolate fudge cupcakes. The sprinkles are very well made and have a terrific texture. Love these. The color contract between dark items and the white sprinkles is so much fun. We use it for our Red Velvet items and it really pops off the plate. A great quality white sprinkle that is bright white. A great topping for our donuts and a great finishing touch to our wedding cake macaroons. This is the second case that we have bought of these white sprinkles. They really do last you a very long time and they are delicious. We do not use white sprinkles often, but these are the best we have found. They are the perfect size and are great for mixing with red and blue during patriotic holidays. I decorated wedding cookies and these were perfect sprinkles. The white color was great and very clean looking. The bulk box worked out great and we put the rest in jars. You generally do not see white sprinkles on many ice cream topping bars, but we added them to ours. They are delicious and very cheap considering what all you get. Plain white sprinkles are simple and elegant. They are great for decorating our snowflake cookies and cakes during the holidays. A very classy way to dress up your baked goods. These sprinkles are by far the best price I have found. They are a great soft true white sprinkle. I have received off white from other vendors. Great tasting too. I love the color and quality of these white sprinkles. They are perfect for helping decorate my confectionary treats for weddings and bridal shower events. A very high quality brand of sprinkles that makes a great topping for ice cream or cupcakes. The sprinkles are packaged nicely and taste great. The white sprinkles are a great topping for our snowflake cookies. Good quality sprinkles. We like to buy the white color in bulk and then custom color them on-site according to our need. These are perfect for that. Love white sprinkles especially when you are covering something that's dark so these ones will stand up much better than the other colored variety of sprinkles. We use these white sprinkles for decorating. They are a nice white and are not dull and faded. When used with darker frosting they really stand out. We love mixing a few of the white sprinkles in with our other colors to add a little flair to our cookies. They arrived quickly and were packaged well. These are great on their own or mixed with other colors. The taste and texture of sprinkles always adds that extra special something to treats. The white sprinkles came in an easy to use bag in a box. They are bright white, not yellow tinted, which makes them beautiful to use on wedding pretzels!! We use the white sprinkles to decorate almost all of our products in our shop. From rolling our handmade truffles in them to create the look of snowballs to sprinkling them on our gourmet caramel apples, they give the winter feel to all our confections. They are the best quality at the best price we've found! These were nice sprinkles. They were not broken into pieces and dust like some others I have purchased. This covered a LOT of pretzel rods. Sprinkles are so popular but at our bakery, we love to custom color them for our customers. These are the perfect bases for any color sprinkle and they are an amazing deal too! We get all different colors in these sprinkles and use them all the time. They are affordable and the colors are bright as well- recommend! These fun sprinkles were really useful this winter for decorating festive and snowtime cupcakes. They look great when sprinkled on colored frosting, especially against light blue. I love being able to buy bulk sprinkles like these white ones. We use them on everything from cupcakes to cake and other sweets. Taste and look superb! I love these white sprinkles! Great value for the quantity ordered. They are great accents to smaller items and also great as stand alone sprinkle. I loved how long and full the sprinkles were....not small and broken! I love being able to get these sprinkles in individual colors. It makes decorating cakes and cake pops a lot easier to do and who doesn't love sprinkles? I love the White sprinkles in the 10 lb. case. They offer a great sugary crunch on all the baked goods. Children and adults both love them. We love using these white sprinkles at the bakery. they give a nice pop of color to any colored frosting and also give a nice texture. This is a great ice cream topper! Nice for sundae bars! Good item for decorating cupcakes and even cakes with! Great price for bulk 10 lb case!!! Come on, everyone loves sprinkles! Especially children. I try to top all my cupcakes with at least a few different colors of sprinkles for a little something extra.